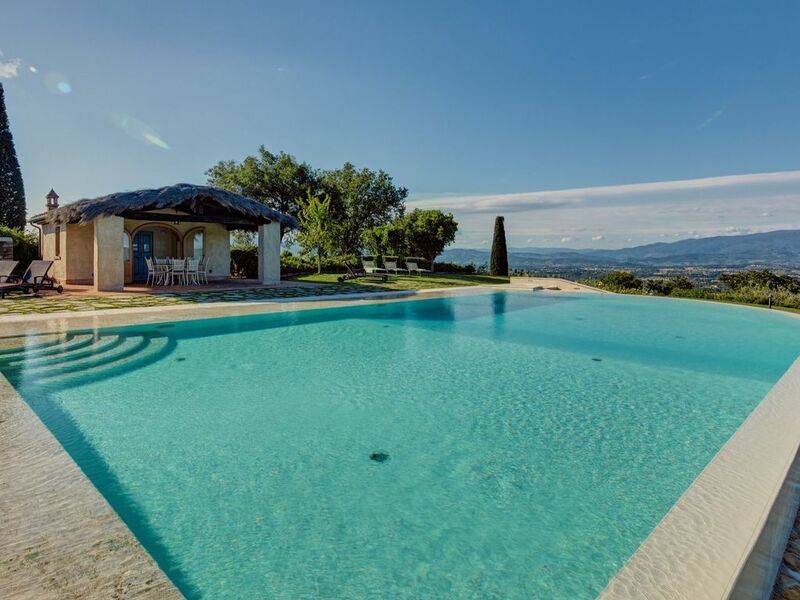 Beautiful, recently restored villa situated on a hill top overlooking the city of Arezzo and the Chiana valley. This property is entirely fenced in and comprises the owners’ house and a charming small church dating back to the 7th century. Outside guests can enjoy use of a large, well-groomed garden with a beautiful, private swimming-pool set in panoramic location. The villa was divided into 4 apartments which are connected internally and are rentable only together as a private accommodation. The interiors are welcoming and tastefully furnished. On the ground floor there is a large, furnished portico ideal for al-fresco dining. A railway line runs in the bottom of the valley. Easy train connections to Florence and Rome are available from the city of Arezzo. Distances: Arezzo with shops of all kinds and railway station 8 km away, Civitella Valdichiana 16 km, Cortona 32 km away, Montepulciano 50 km, the Val d’Orcia area is within 50 – 80 km, Florence 80 km away, Siena 80 km, Orvieto 90 km away, Rome 220 km away. At guests’ disposal: large garden, beautiful, private, irregular-shaped swimming-pool (circa 16 x 8 m – min. depth 1,2 m – max. depth 3 m –salt-water purification system- open from 01/04 through 30/10), Jacuzzi area, large furnished solarium with a pergola and a small house with dressing-room, toilet, 2 showers and a small kitchen corner, nice portico ideal for al-fresco dining. This villa provides WI-FI internet connection (free of charge). The property owners run a farming estate and the can organize olive oil, wine, balsamic vinegar and spirits tasting. Extra Services: Baby bed at € 25,- payable on the spot (to be requested at booking confirmation). Maid service available by arrangement at € 10,- / per hour. The sofa-bed on the first floor bed is available at € 150,- / per person / per week – payment on site. Ground floor: living-room (satellite TV, DVD reader) with fireplace, dining area and kitchen corner (oven, freezer, dishwasher, microwaves), double bedroom, bathroom with shower, store-room with washing-machine, second dining area (satellite TV) with kitchen corner (freezer, dishwasher, microwaves). 1st floor (accessible from the second dining area): double bedroom (air conditioning), bathroom with shower. 2 steps up and then 2 steps down (from the living-room): additional dining area (satellite TV) with kitchen corner (oven, freezer, dishwasher). 1st floor: 2 double bedrooms (air conditioning), 2 bathrooms with shower. 2 steps up: living-room (satellite TV) with double sofa-bed (available at € 150,- / per person / per week), dining area and kitchen corner (oven, freezer, dishwasher, American coffee maker, toaster). We had an excellent stay in Villa Agazzi. The view from the property is magnificent and our kids will for sure remember this XL pool-with-view for the rest of their lives. On our arrival, a full basket of vegetables from the garden was on the table and a bowl with eggs as well as some basic supplies where in the fridge. Every evening we enjoyed the free shows that come with the superb view: fireworks in nearby villages, lightnings and/or beautiful sunsets. The owners (a couple with their young daughter) live in the other house on this property but respected 100% our privacy and only came by to bring us some home-made treats now and then. The little chapel is a small extra especially when you like to sing or brought your instrument: the acoustics are top! If you are thinking of preparing big family meals, take into account that the house in fact has 4 (limited) kitchen-units (you can use it as 4 semi-separated living units for 4 couples) so it requires some agility to get everything organised. Beds are very comfortable although rather short for people over 1m90. Next to Arezzo, we visited Cortona, Montepulciano, Lago di Trasimeno and the breathtaking city of Siena all within 1h drive. Worth the drive up the hill daily for the amazing views during the day and stunning sunsets in the evenings. We could find no fault with the villa. We loved it. Perfect Stay for our Holiday, nice View, super pool, nice rooms, perfect Garden! Patricia is very friendly and all pictures from the website are total realistic. Amazing place...breathtaking views, wonderful hospitality, the perfect place to relax and fill your heart with happiness. everything was just perfect and i look forward to staying there again sometime.